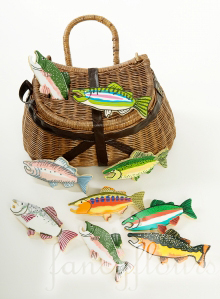 Perfect for the fishing enthusiast, these festive fishies are just waiting to be caught! These amazing cookies have been hand decorated by Redmond, Oregon company, Cookies ‘Cream. Their work is absolutely incredible and delicious, I might add! Visit them online at http://www.cookiesncream.com. We couldn’t resist having them decorate some of our fun fish cookie cutter shapes. For close up views of these and several other fish shapes, please visit fancyflours.com.